#StyleYourWayToPARIS: The Shortlist Is Announced! 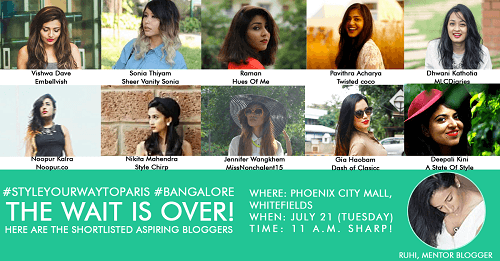 So many fabulous bloggers have applied for three prestigious spots in this year’s edition of #StyleYourWayToParis. But now, take a deep, deep breath, because the wait is FINALLY over! 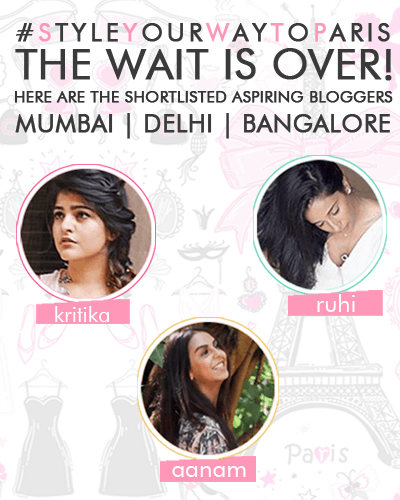 Here are the super-stylish lot who are shortlisted for the city-wise events in Delhi, Mumbai and Bangalore. They will go on to compete for the next stage of Style Your Way To Paris 2015! 1) Himanshi Goel Of Bees And Baubles 2) Shaurya Of Morphology Blog 3) Tenzin Choezin Of Gurls Closet Diaries 4) Niki Mehra Of Niki Mehra 5) Urvashi Kumar Of The Right Shade Of Red 6) Milly Ghumman Of MyODesigns 7) Purnima Bali Of The Burbak Gypsy 8) Komal Pandey Of The College Couture 9) Malvika Rallan Of The Daily Aaloo 10) Karishma Yadav Of Pink Trunk Now, all you pretty ladies have to do is dress up and show up at DLF Promenade Mall on July 14 (Tuesday) at 11 a.m. 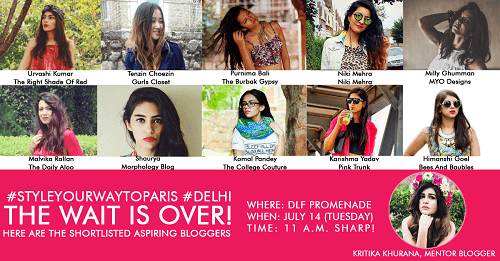 There are a bunch of exciting challenges planned and you will get to meet our Delhi Mentor Kritika Khurana of That Boho Girl. The winner and Kritika will compete in a face-off against the other two city teams! 1) Sarika Nagdeo Of The Style Compile 2) Sanaa Bano Khan Of Haute Culture 3) Karishma Rawat Of Ginger Snaps XOXO 4) Deepika Sharma Of DeeBrew 5) Simran Of The Vogue Amigo 6) Niitka Choraria Of The Glitter Crumb 7) Natasha Shrotri Of Mariposa Love 8) Madhumita Chakravarty Of En Vogue: Diva M 9) Jas Sagu Of Woman I Love You 10) Simran Handa Of Wear Your Vogue The Mumbai event is being held at the Palladium Mall on July 17 (Friday) at 11 a.m. Our Mumbai mentor Aanam Chashmawala of What When Wear will be there to select the one lucky winner who will be her plus-one in this year’s most exciting and stylish competition. 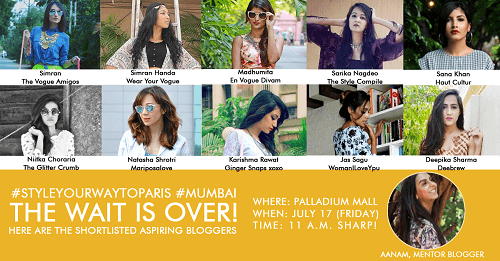 1) Pavihtra Acharaya Of The Twisted Coco 2) Noopur Kalra Of Simply Moda 3) Jennifer Wangkhem Of Miss Nonchalant 4) Gia Haobam Of Dash Of Classic 5) Vishwa Dave Of Embellvish 6) Raman Of Hues Of Me 7) Sonia Thiyam Of Sheer Vanity Sonia 8) Dhwani Kathotia Of My Little Cupboard 9) Nikita Mahendra Of Style Chirp 10) Deepali Kinni Of A State Of Style The Bangalore event will be held at the Phoenix Market City Mall, Whitefields on July 21 (Tuesday) at 11 a.m. You get to meet and hang out with Ruhi Sheikh of Republic Of Chic - and if you play it right - you will be just another step closer to an amazing trip to Paris! Congratulations to our fabulous shortlisted bloggers! Good luck, and see you all very, very soon!